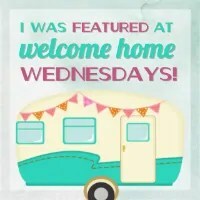 Welcome to Welcome Home Wednesdays #83!!! If you’re new, glad to meet you. If you’re returning welcome back! Wow, what a winter storm hitting the East. (Yeah, it’s winter for a couple more days!) I hope those of you affected are staying safe and warm! Well, we’ve got lots of lovely links to make it happy around here. Take a few minutes and see what everyone’s been up to! We appreciate you being here this week! Like any good hosts we’re sitting right by the present table waiting until our guests leave so we can go through the loot… the loot being your Welcome Home Wednesdays #83 links! We can’t wait to check out what you’ve left for us. Trust me there will be a lot of pinning, tweeting and facebook sharing going on in the near future… we can’t wait to show off what you’ve left! Happy Wednesday Erin, Thank you for the party!! Thank you Erin for co-hosting the 87th Welcome Home Wednesday, always appreciated. so nice to see you here, Joy! Have a wonderful day! Thanks for hosting. I hope you are having a wonderful week.